How Does Societal Transformation Happen? Values Development, Collective Wisdom, and Decision Making for the Common Good was written by Leonard Joy and published for Quaker Institute for the Future by Producciones de la Hamaca, Caye Caulker, BELIZE - 80 pages (2009). There is a pervasive sense in our society that we are in a bad place and things are getting worse. This study by Leonard Joy, a veteran of international economic and social development work, is aimed directly at the kind of societal transformation required to stop this slide into catastrophe and begin to advance the growth of security and well-being for human communities and the whole commonwealth of life. His insights are both necessary and timely. With increasing recognition and implementation, they might also be sufficient. According to Leonard Joy’s well-seasoned vision, this integrated task requires moving into the next phase of human values development where the world is seen not as “a problem with which I must cope” but as a “creative project in which I want to participate.” Movement in this direction constitutes a transformation in both the kind of person a society promotes and the kind of society individuals promote. Emerging out of this reciprocation would be a transformed set of values embracing equity, integration, actualization, and service. Communication would take on an ethic of honesty, sincerity, comprehensibility and truthfulness. There would arise an appreciation of interdependency, an impulse toward generosity, and a respect for thresholds, limits and boundaries. 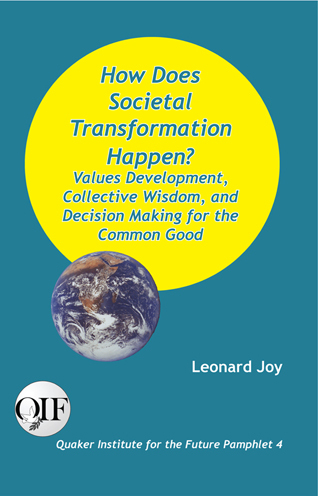 Leonard Joy sees individual values development as a prototype for societal transformation. He helps us understand the progression of human values development and the associated dynamics of societal transformation. He challenges precepts of international economic development advancing instead a practice of societal development. The pamphlet is a guide for understanding the metamorphosis of societal transformation, and a manual for the practice of collaborative discernment and effective decision making for the common good.